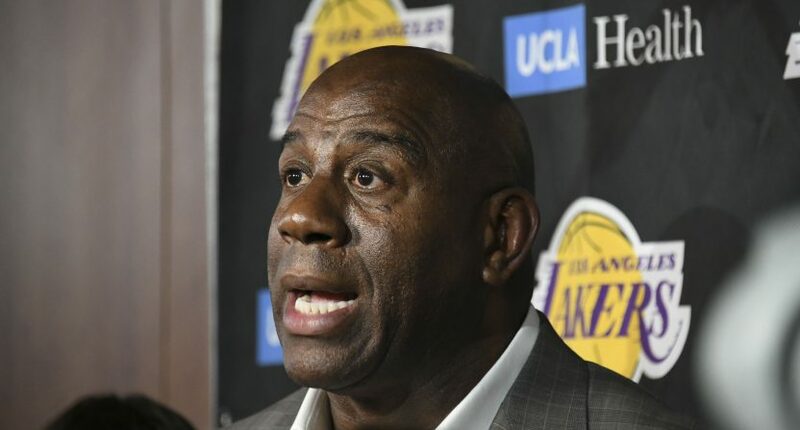 After barely two years on the job as president of basketball operations for the Los Angeles Lakers, Magic Johnson shockingly resigned from the position in an impromptu press conference on Tuesday night. Johnson, one of the best players in Lakers’ history, was brought in to save a once-great franchise. But his team ultimately failed to rise above mediocrity, never winning more than 35 games in either season he oversaw the team. While Johnson did bring in superstar LeBron James, a few of his decisions—or lack thereof—ultimately sunk the Lakers. Here are his worst decisions as team president. General manager Rob Pelinka deserves some of the blame for the Lakers’ roster woes, but Johnson was ultimately the man in charge. Johnson wanted to establish a new identity in L.A. and moved on from some key players last offseason. He surprised center Brook Lopez by letting him walk in free agency and renounced power forward Julius Randle after a career year. Lopez would sign with Milwaukee where his three-point shooting and shot blocking helped the Bucks to the top seed in the East. Meanwhile, Randle took a step forward in his potential and averaged a career-best 21.4 points for New Orleans. Those two forwards would have been perfect fits alongside LeBron. Instead, the Lakers’ forward depth was underwhelming at best. Once the Lakers secured James on the free agent market, they surrounded him with questionable talent that did not maximize his strengths on the court. Johnson brought in a group of players with checkered reputations: Rajon Rondo, Michael Beasley, Lance Stephenson, and JaVale McGee. He also re-signed Kentavious Caldwell-Pope. James needed good three-point shooters surrounding him, not guys who held onto the ball too long and made questionable decisions. To be fair, McGee turned in a solid year. However, virtually all the other free agent signings Magic made last summer were busts. Bringing in James was a huge coup, but not giving him more support cost the Lakers a playoff spot. Johnson’s roster was loaded with plenty of young talent in Kyle Kuzma, Lonzo Ball, Josh Hart, and Brandon Ingram. Yet, he opted to keep all of them in the fold instead of trading them for another proven superstar. In the modern NBA, it is practically impossible to win a title with just one star. The Lakers did not even have a traditional #2 star. If Johnson was proactive and chased Kahwi Leonard or Jimmy Butler, L.A. would likely have two teams in the playoffs this season. LeBron is superhuman, but he is also 34 years old. He needed his workload lightened. Instead, he was asked to do much and flamed out and got frustrated as the season ended. Trading Ivica Zubac, a former second-round pick that started 12 games for the Lakers in 2018-19, might not seem like a big deal at first. But moving him showed just how wrong Johnson’s strategy in building a team was. Zubac showed some promise during his first two seasons with the Lakers, but never emerged as a serious rotation piece until this year. Zubac played well for the Lakers this season, putting up career-high scoring numbers with 8.5 points, 4.9 boards while shooting nearly 60 percent from the field and just over 85 percent from free throw line. At 22, he appeared to be a nice piece for the team going forward. So, when Zubac was traded to the Clippers for Mike Muscala, the move represented a clear misunderstanding of assets by Johnson. Zubac had starter potential, but in an effort to win now, he was traded for a replacement-level role player. Selling low on a decent asset was a mistake. Zubac has started 24 of 25 games for the playoff-bound Clippers while putting up career-best numbers in the process. Coach Luke Walton was not a Magic Johnson hire and there always seemed to be animosity between the two, so it was not a shock he was on the hot seat as L.A.’s season started to fall apart. Walton could be a great head coach some day, but Johnson could have salvaged the season or, at the very least, lit a spark under his team by making a change. Instead, he watched Walton and LeBron go down with the ship. Oddly enough, Johnson admitted after his resignation he received permission to fire Walton after the season from Jeanie Buss but did not do so.